Slangkop lighthouse is the tallest iron tower on the South African Coast and sits at the one end of Kommetjie. It measures 100 feet from base to the balcony and has been operational since 1919. Every lighthouse has a different frequency of flashes and this one emits four flashes every 30 seconds as it turns and can be seen for 33 sea miles. 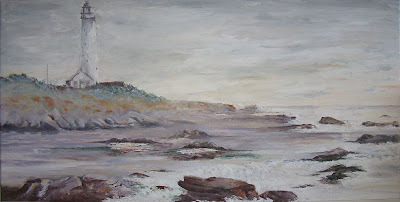 Here is an oil painting of the lighthouse from a photograph Bryan took. I would like to do a watercolour of it sometime soon.